So mother came back last Saturday after a one month vacation/business trip to Japan. I was excited for her return because it’s almost Christmas and I asked her to buy me a copy of Vogue Nippon. 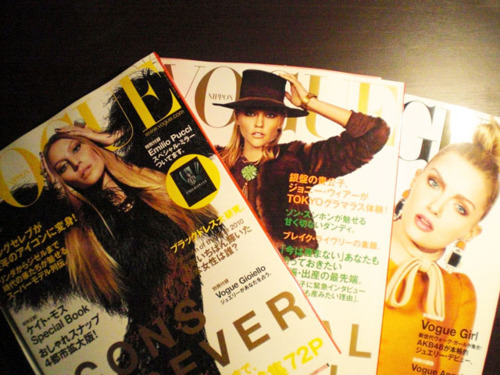 I’m becoming addicted to fashion magazines and have started collecting them, including foreign ones. She bought me three issues, from November ‘10 to January ‘11. The magazines are terribly heavy (mother almost had to pay for excess baggage) but incredibly awesome, thanks in part to Anna dello Russo, Vogue Nippon’s Fashion Director-at-Large and Creative Consultant. I couldn’t understand a thing but the editorials were amazing. I just wished they featured local models like what Vogue Korea does. Speaking of international editions of Vogue, I ordered a copy of the December ‘10 issue of French Vogue, the one where Tom Ford guest edits. Oh, for the January ‘11 issue of Vogue Nippon (the one with Gisele on the cover), they gave away a Pucci mirror. Mother also got me other stuff like underwear from Uniqlo, green tea flavored marshmallows and candy (which tasted divine), a bag from Harrod’s (is there Harrod’s in Tokyo? ), and some local magazines. 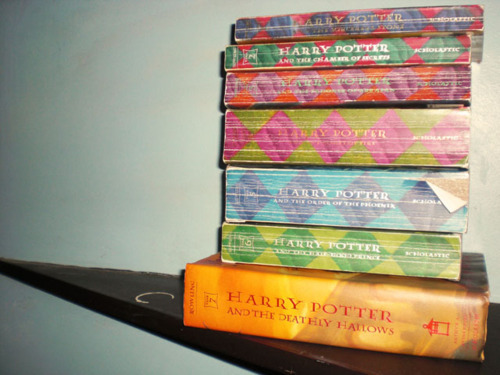 The following day, I had another treat as a box arrived from my grandmother in California and she got me the complete collection of the Harry Potter series. I’ve been meaning to buy the boxed set but my grandmother was a dear. She found them at a garage sale and I love how they look “loved,” a fancy term for worn. This is my fifth copy of The Sorcerer’s Stone and my second copy of books two to five. I lost all of them. 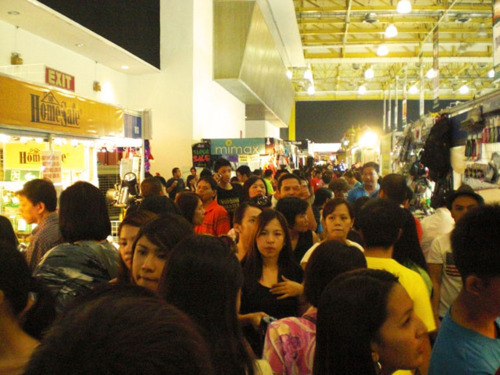 That afternoon, we went to the World Bazaar Festival in World Trade Center. There were so many people and I hated it. I’m not good with crowds so I wasn’t able to appreciate the wares. 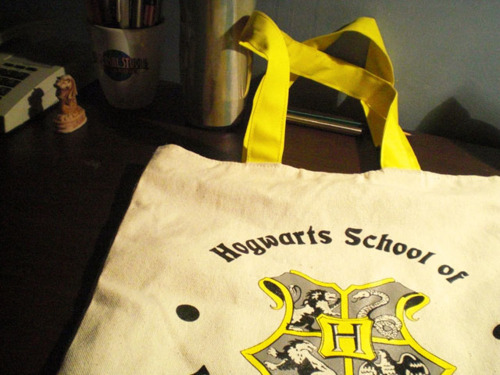 I have a cynical view of tiangges (they sell the same things everywhere) but I did find two adorable stuff: a Hogwarts bag and ankle boots from Brazil (?) that cost P800. 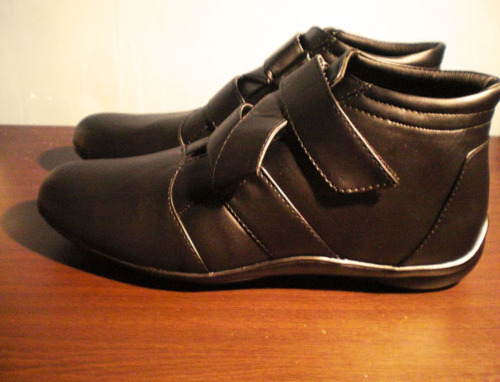 The shoes look small in the picture but they’re actually a size 9, which come to think of it, is small for a man’s foot. Mother must have felt my irritation because she insisted we leave for Mall of Asia, which was surprisingly empty for a Sunday. There I went on an impromptu mission: to go to all seven bookstores/magazine stores (Fully Booked, NBS, Powerbooks, Books For Less, Filbar’s, Booksale, and this little store across Starbucks) to look for other fashion magazines and/or copies of any foreign Vogue. 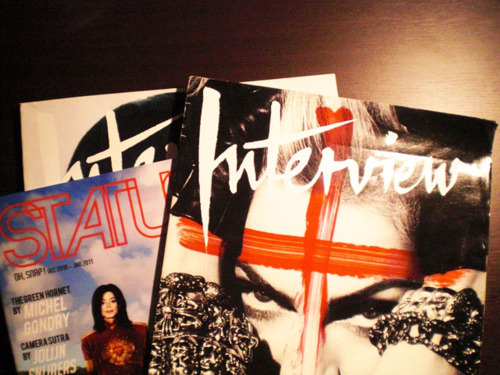 I ended up with two issues of Interview (appropriate because I got a copy of The Andy Warhol Diaries edited by Pat Hackett two weeks ago) and the latest issue of STATUS with David LaChapelle, my favorite photographer. 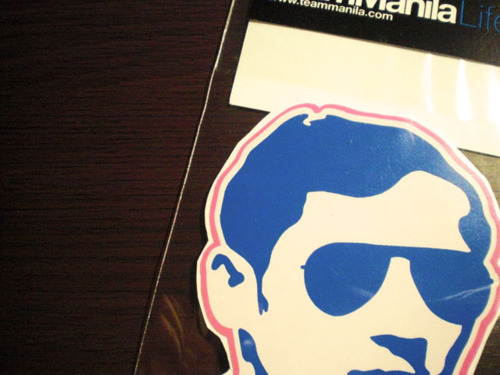 I also got this Pop Art sticker of Jose Rizal from Team Manila. On Thursday, I was out with the folks at my ninang’s place for a Christmas party. It was for my ninang and the girls who at one point worked at her modeling agency. She got me a copy of The Teen Vogue Handbook, which her son’s stylist girlfriend picked. According to my ninang, the girl became an established stylist because of the book. She used to work in Singapore but Summit Media got her to work for Candy magazine. Then yesterday, I was with my classmates from NSTP and we went to Cavite for a Christmas party for some families we adopted. I brought bags of candy and gave them out to random kids and it was such a nice feeling giving to those in need. 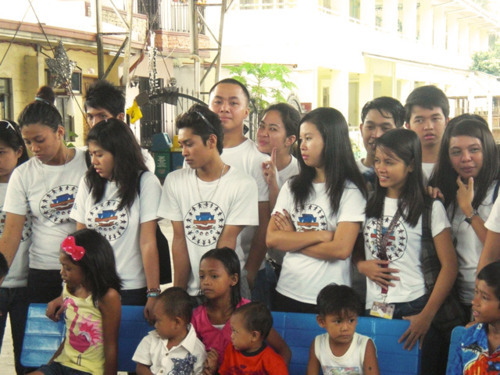 The guy and girl looking at the camera are two of my groupmates, who were kind enough to adopt me.